Sludge and Muck Reducers Formulated for the removal of organic bottom solids that are slow to degrade, especially helpful in ponds that have a rock or gravel bottom or where vacuuming is impractical. Formulated for the removal of organic bottom solids that are slow to degrade, especially helpful in ponds that have a rock or gravel bottom or where vacuuming is impractical. Formulated to break down organic solids and pond sludge. As these organic solids break down, toxic gasses are released. These gaseous by-products can endanger fish, marine life and plants. Liquid sludge removers immediately helps eliminate potential harmful gaseous compounds while clarifying your pond water at the same time. Specially selected bacterial strains immediately begin breaking down sludge build-up. A 100%-natural product, safe for all pond fish, plants and wildlife. Pellets sink directly to the pond bottom and are the perfect choice for shorelines and natural ponds with overflows. Use sludge removers to accelerate the solubilization and biological digestion of organic solids in your pond. Reduces and eliminates potential harmful gaseous compounds and helps clarify your pond water at the same time. Helpful in ponds that have a rock or gravel bottom or where vacuuming is impractical. Available in liquid, dry and pellet formulas. Aquascape Sludge Cleaner Bubble Tabs contain over 500 million concentrated heterotrophic bacteria, including fast-acting enzymes and humic acid that can often help soften pond water. 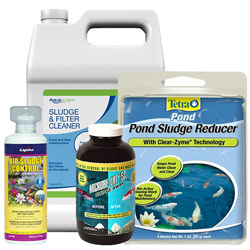 This combination of natural cleaners helps to keep pond bottoms and filters clean and clear resulting in less pond maintenance. Because ornamental water gardens are enclosed ecosystems, sometimes factors like fish load, uneaten fish food, organics such as leaves, sludge and unwanted debris may disrupt the balance. Aquascape Sludge Cleaner Bubble Tabs maintain a strong biological balance; providing clean, clear and healthy water conditions. Can help soften pond water, promote plant growth and prevent unsightly water conditions. Add to the area of the pond with the most circulation or directly into problem areas. For new ponds, treat 2 times per week for the first 2 weeks. For mature ponds, treat weekly. Aquascape Stream and Pond Clean S.A.B. Stream and Pond Clean maintains a strong biological balance, providing clean, clear and healthy water conditions.Stream and Pond Clean contains pure strains of concentrated beneficial bacteria and enzymes. Ideal for breaking down debris in ponds, streams and waterfalls, this combination of natural cleaners helps to maintain a strong biological balance in your pond. Because ornamental water gardens are enclosed ecosystems, sometimes factors like fish load, uneaten fish food, organics such as leaves, sludge, unwanted debris or after-use of an algaecide or algae treatments may disrupt the pond's balance. Mix product in a clean bucket used only for your pond. S.A.B. should be activated in the bucket with warm water(about 80°F) and poured around the perimeter of the pond or stream. When mixed, the product should be added to the pond quickly to provide the best results.Pond water may become temporarily clouded depending on the pH of the pond. One scoop treats up to 100 gallons of water. When adding to the pond for the first time, or if water quality is poor, use a double dose weekly for the first 2 weeks. Continue adding 1 scoop per 100 gallons of pond water every 2 weeks throughout the season as a maintenance dosage and to maintain optimum water quality.